Hello everyone, my name is Michelle Kaioh (or Michiru Kaioh in Japanese). My primary interest is definitely playing the violin. I'm a very skilled violinist and play at professional levels (if I do say so myself). 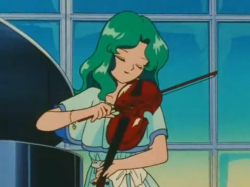 As well as loving the violin, I also dearly love Amara Tenoh. She and I fight alongside each other through thick and thin in all of life's battles. I'm quite graceful and I come from a wealthy family. You want to hear something interesting? I am also Sailor Neptune! With beauty and elegance, I fight for the planet Neptune with the raging powers of water alongside Sailor Uranus.